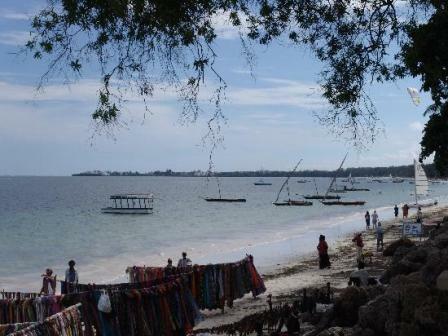 If you are in visiting the Mombasa or Diani Beach areas of Kenya, don’t miss out on a well kept secret location. Shimba Rainforest Lodge is sited on a watering hole in the Shimba Rainforest Reserve in the hills above Diani beach. After a few days relaxing on a hot, sweaty beach, this hotel is the perfect antidote. There are no beach boys trying to sell you carvings, very few mosquitos and very little noise - there are signs everywhere saying "Please speak softly" so that you do not scare the wildlife away. You can stay overnight (highly recommended) or just go for lunch. It is worth spending the day in the reserve with a driver/ guide so that you have an opportunity to see all of the wildlife on offer. There is not so much here as at the other big national parks, but there aren't so many people either!! This makes for a much more intimate and relaxed experience. The Lodge can arrange game drives for you if you don't have your own driver. This is a very special place with the most wonderfully attentive staff you are ever likely to meet. A real find. The reserve is beautifully located approx. 1 hour drive from Diani Beach, South Coast. There are forests, savannah landscape, ponds with lilac water lillys, hills, palms and we really liked the varied landscape in this park! We did the guided walk through the rainforest to the Sheldrick Falls with an armed ranger and it was really interesting! We did see elephants along the way - at a distance - and a lot of beautiful flowers and butterflies. The waterfall was nice, too, as it had rained the night before and now, it was really impressive! Animals which we did see during our game drives in the park were buffalos, lots of elephants, a thomson gazelle, two giraffes, warthogs, birds, but unfortunetly not a single sable antelope, which this reserve is so well-known for. We had lunch, dinner and breakfast at the Shimba Rainforest Lodge and the food was excellent. From the restaurant deck, you had a great view of the waterhole, but there was not much activity going on there while we were there. We saw an African fish eagle, a monitor lizard in the water and lots of hornbills daytime. There is a safe short wooden walkway through the rainforest from the lodge. It gets cold in the eveing, so do take with you warm clothes! The staff puts out banana for the bush baby every evening and we waited a long time for seeing it - and we did! It was a really cute little bush baby - one of the highlights of the Shimba Hills stay for us! The rooms are simple, twin-rooms with moskito nets, so we didn`t have a double-bed. We did not see any moskitos while we were there, though. There is a small balcony as well. We did enjoy our stay at Shimba Hills and Shimba Rainforest Lodge, even if we did not see any sable antelopes and even if the lodge/room was very basic, but the staff was very friendly, food excellent and the cute bush baby alone makes an overnight stay to Shimba Hills worth it!